Mercier was a French professional cycling team that promoted and raced on Mercier racing bikes. Together with the Peugeot team, the Mercier team had a long presence in the cycling sport and in the Tour de France from 1935 until 1984. Jacques Anquetil was a French road racing cyclist and the first cyclist to win the Tour de France five times, in 1957 and from 1961 to 1964. Masbaraud-Mérignat is a former commune in the Creuse department in the Nouvelle-Aquitaine region in central France. 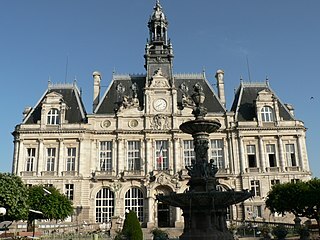 On 1 January 2019, it was merged into the new commune Saint-Dizier-Masbaraud. Creuse is a department in central France named after the river Creuse. Sauviat-sur-Vige is a commune in the Haute-Vienne department in the Nouvelle-Aquitaine region in west-central France. Louis "Louison" Bobet was a French professional road racing cyclist. He was the first great French rider of the post-war period and the first rider to win the Tour de France in three successive years, from 1953 to 1955. His career included the national road championship, Milan–San Remo (1951), Giro di Lombardia (1951), Critérium International, Paris–Nice (1952), Grand Prix des Nations (1952), world road championship (1954), Tour of Flanders (1955), Critérium du Dauphiné Libéré (1955), Tour de Luxembourg (1955), Paris–Roubaix (1956) and Bordeaux–Paris (1959). National service is a system of either compulsory or voluntary government service, usually military service. Conscription is mandatory national service. The term national service comes from the United Kingdom's National Service Act 1939. Many young people spent one or more years in such programmes. Compulsory military service typically requires all male citizens to enroll for one or two years, usually at age 18, while voluntary national service requires only three months of basic military training. The US equivalent is Selective Service. In the United States, voluntary enrollments at the Peace Corps and AmeriCorps are also known as national service. Pierre Chany was a French cycling journalist. He covered the Tour de France 49 times and was for a long time the main cycling writer for the daily newspaper, L'Équipe. The army sent Poulidor to the war then going on in Algeria, where he worked as a driver and put on 12 kg through lack of exercise. In 1960 he dedicated himself to cycling again and lost the weight in a month. He won his first race after army service by six minutes. When he then came second in the GP de Peyrat-le-Château and won 80,000 old francs, he calculated that he had won more in one race than he would have earned in six years on the farm. Poulidor's best chance of defeating Anquetil came in the 1964 Tour de France, in the finish on the Puy de Dôme. Anquetil rode beside Poulidor but both were so exhausted that only in the last few hundred metres could Poulidor take nearly enough time to threaten Anquetil's first place in the general classification. The Tour organiser, Jacques Goddet, was behind the pair as they turned off the main road and climbed through what police estimated as half a million spectators. Anquetil rode on the inside by the mountain wall while Poulidor took the outer edge by the precipice. They could sometimes feel the other's hot gasps on their bare arms. At the end, Anquetil cracked, after a battle of wills and legs so intense that at times they banged elbows. Poulidor says he was so tired that he has no memory of the two touching, although a photograph  shows that they did. Of Anquetil, the veteran French reporter Pierre Chany wrote: "His face, until then purple, lost all its colour; the sweat ran down in drops through the creases of his cheeks." 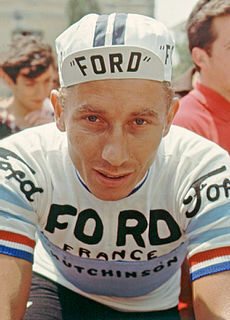 Anquetil was only semiconscious, he said. Poulidor gained time but when they reached Paris, Anquetil still had a 55-second lead and won his last Tour de France thanks to the time-trial on the final day. Poulidor's original nickname was Pouli. It was Émile Besson  of the daily newspaper L'Humanité who first wrote of Poupou. The name was taken up throughout France, leading to headlines such as "Poupoularité" in L'Équipe . A poupée is a doll and the nickname hints at that and follows the French tradition of repeating the first syllable of a word in childspeak. Poulidor has never liked the name but accepts it. On 25 January 1973 Poulidor was made a Chevalier de la Légion d'honneur. In 2003 the President, Jacques Chirac increased the award. Poulidor also has a rose named after him, reflecting his love of gardening in general and roses in particular. He lives with his wife Gisèle in Saint-Léonard-de-Noblat, east of Limoges, where he makes short trips on his mountain bike. Their daughter, Corinne, is married to the former world cyclo-cross champion and Tour of Flanders winner Adri van der Poel. His grandsons David and Mathieu are also cyclists. Mathieu van der Poel became cyclo-cross world champion himself in the junior race in Koksijde in 2012 (Koksijde) and in 2013 in Louisville, and with the elite in 2015 (Tabor) and 2019 (Bogense). Jesús Luis Ocaña Pernía was a Spanish road bicycle racer who won the 1973 Tour de France and the 1970 Vuelta a España. Stephen Roche is an Irish former professional road racing cyclist. In a 13-year professional career, he peaked in 1987, becoming the second of only two cyclists to win the Triple Crown of victories in the Tour de France and the Giro d'Italia general classification, plus the World road race championship, the first was Eddy Merckx. Roche's rise coincided with that of fellow Irishman Sean Kelly. Santiago Botero Echeverry is a Colombian former professional road bicycle racer. He was a pro from 1996 to 2010, during which time he raced in three editions of the Tour de France and four editions of the Vuelta a España. He was best known for winning the mountains classification in the Tour de France, and the World Championship Time Trial. Christophe Moreau is a French former professional road racing cyclist. For many years Moreau was the primary French contender for the general classification in the Tour de France: he finished in the top 12 in the GC five times and finished the race as best Frenchman in 2000, 2003, 2004 and 2005. He also enjoyed success in the Critérium du Dauphiné Libéré, winning the race overall in 2001 and 2007. Federico Martín Bahamontes, born Alejandro Martín Bahamontes, is a Spanish former professional road racing cyclist. He is the first cyclist to complete a "career triple" in winning the "King of the Mountains" classification in all three Grand Tours. John James 'Sean' Kelly is an Irish former professional road bicycle racer, one of the most successful road cyclists of the 1980s, and one of the finest classics riders of all time. From turning professional in 1977 until his retirement in 1994, he won nine monument classics, and 193 professional races in total. He won Paris–Nice seven years in a row and the first UCI Road World Cup in 1989. He won the 1988 Vuelta a España and had multiple wins in the Giro di Lombardia, Milan–San Remo, Paris–Roubaix and Liège–Bastogne–Liège. Other victories include the Critérium International, Grand Prix des Nations and smaller tours including the Tour de Suisse, Tour of the Basque Country and Volta a Catalunya. Philip Grant AndersonOAM is an Australian former professional racing cyclist who was the first non-European to wear the yellow jersey of the Tour de France. Lucien Aimar is a French cyclist, who won the Tour de France in 1966 and the national road championship in 1968. He is now a race organizer. He was born in Hyères, France. Philippa York is a Scottish journalist and former professional road racing cyclist. Roger Pingeon was a professional road bicycle racer from France. Ludovic Turpin is a French professional road racing cyclist, who last rode professionally for UCI Professional Continental team Saur–Sojasun. As of 2014, he competes for amateur team Vélo Club Grand Case. Gilbert Duclos-Lassalle is a former French professional road racing cyclist who was a specialist at one-day classic cycling races. He raced from 1977 to 1995, one of the best French riders of a generation that included Bernard Hinault and Laurent Fignon. André Darrigade is a retired French professional road bicycle racer between 1951 and 1966. Darrigade, a road sprinter won the 1959 World Championship and 22 stages of the Tour de France. Five of those were on the first day, a record. Frédéric Guesdon is a French former professional road bicycle racer who competed as a professional between 1995 and 2012, most notably for UCI ProTeam FDJ–BigMat, spending 16 years of his career with the team. Didier Rous is a French former professional road bicycle racer. Armand de Las Cuevas was a French racing cyclist. Urs Zimmermann is a Swiss former professional road racing cyclist. He stood on the podium in two of the three Grand Tour events after finishing third in 1986 Tour de France and 1988 Giro d'Italia. 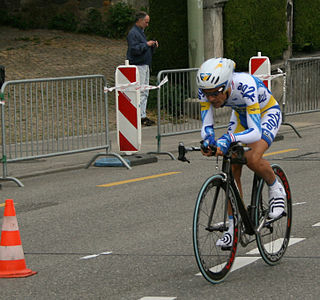 He also won several stage races such as the Tour de Suisse, Dauphiné Libéré and Critérium International. Yuri Viktorovich Trofimov is a Russian road bicycle racer who last rode for UCI Continental Team Rádio Popular–Boavista. Previously, he raced for Bbox Bouygues Telecom (2008–2010), Team Katusha (2011–2015), Tinkoff (2016) and Caja Rural–Seguros RGA (2017). Vincent Vitetta is a former French cyclist. Professional from 1951 to 1961, he was the winner of the Tour d'Algérie in 1952. He ended his career as an independent racer in 1961. ↑ Émile Besson joined the Resistance, became a communist and worked all his life for the communist press, first the Union Française d'Information and then the daily paper, L'Humanité. He started as a messenger and ended on Humanité's sports desk, where he stayed until he retired in 1987. He pioneered western interest in the Peace Race, run between Warsaw, Berlin and Prague and at one time the biggest amateur race in the world. ↑ "Raymond Poulidor". Cycling Archives. Retrieved 27 September 2017. ↑ "Palmarès de Raymond Poulidor (Fra)" [Awards of Raymond Poulidor (Fra)]. Mémoire du cyclisme (in French). Retrieved 27 September 2017. Wikimedia Commons has media related to Raymond Poulidor .